A 1-day workshop giving an introduction to the lampworking technique. A 1-day workshop for those who have followed the introductory workshop and want to learn some new techniques. 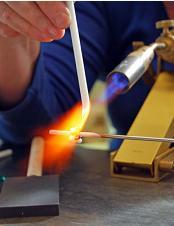 A chance to sit behind a torch and make your first beads. This is a private 90-minute mini-workshop for 1 or 2 people. Click here to hear about future workshops.